Our journey through New England with my sister, Marylou, and her husband continued into New Hampshire. 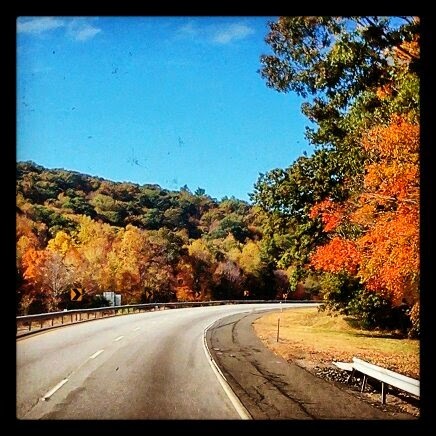 It was perfect timing to be here (October 7-9, 2013) with the fall colors and crisp air. The sun, lower in the sky now, filtered it’s light into the windows of the studio making it very calming and serene. The front of the studio and alter area. Ohana is situated in what used to be a single story house, so it’s very inviting and has a comfortable feel. Lots of windows allow for natural lighting, a far cry from the overhead florescent bulbs I’ve experienced in larger studios making them feel like a “gym” and not a “sacred space”. Marylou and I decided to get up early for a mixed levels class in the hopes it would challenge us a little. 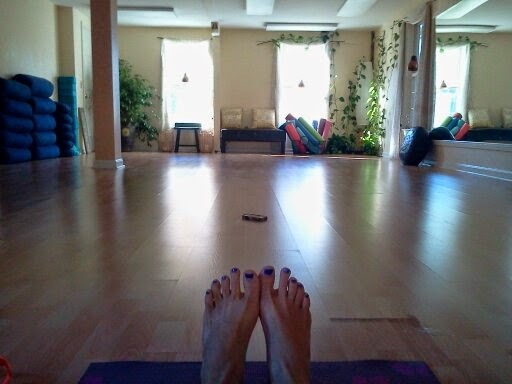 One of the hard things about doing yoga-on-the-road is determining whether or not a class will feel one’s needs. While I have no problem taking beginner level classes (which are always good for remembering the basics and checking in on alignment basics we tend to forget) I sometimes want a challenge, especially if I’m paying over $10 per class. I want to learn new things and have someone check out my form as I learn new (advanced) poses. 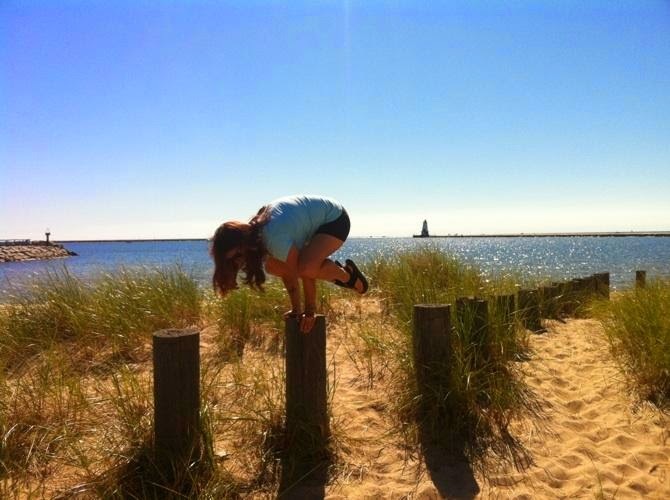 I want to do a handstand or arm balance or something even crazier! Between classes (and while we were parking for 5 weeks in my sister’s driveway) Marylou and I had been practicing yoga together daily…challenging each other with more difficult poses that demanding strength and balance. We pushed one another to work on those poses we each dislike (we all have them)…mine is reverse triangle (and shoulder stand and plow) and hers is chair pose. 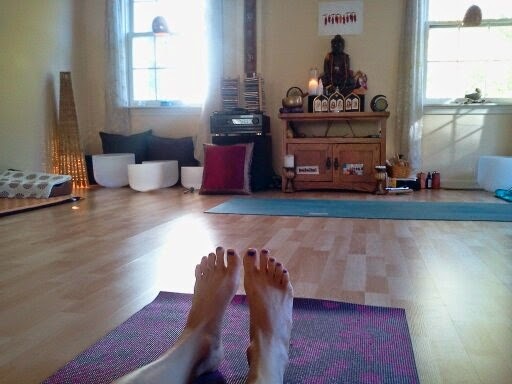 So, can you imagine how joyful I was when this class involved about 25 chair poses?!? Take THAT Marylou! 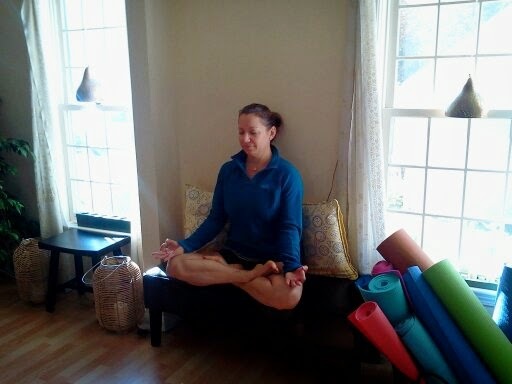 This was the first time I had an instructor use chair pose as a transition pose to move into so many other poses. 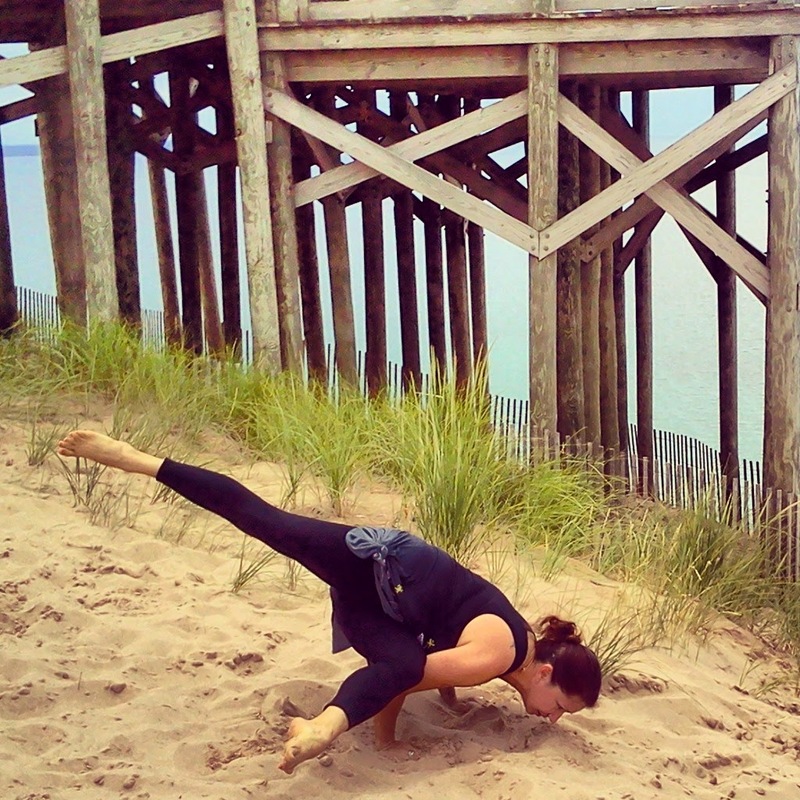 It made for an interesting class and even Marylou seemed to have a new appreciation for the pose since we learned how to move into poses like Eka Pada Koundinyasana I.
Eka Pada Koundinyasana I (a work in progress) at Sleeping Bear Dunes, Michigan. The class was very well run…fun, challenging, exciting…everything I had been looking for. Even the instructor, Shira, was engaging and supportive. She came around and made corrections and suggested new ways of entering poses which has really enhanced my home practice. 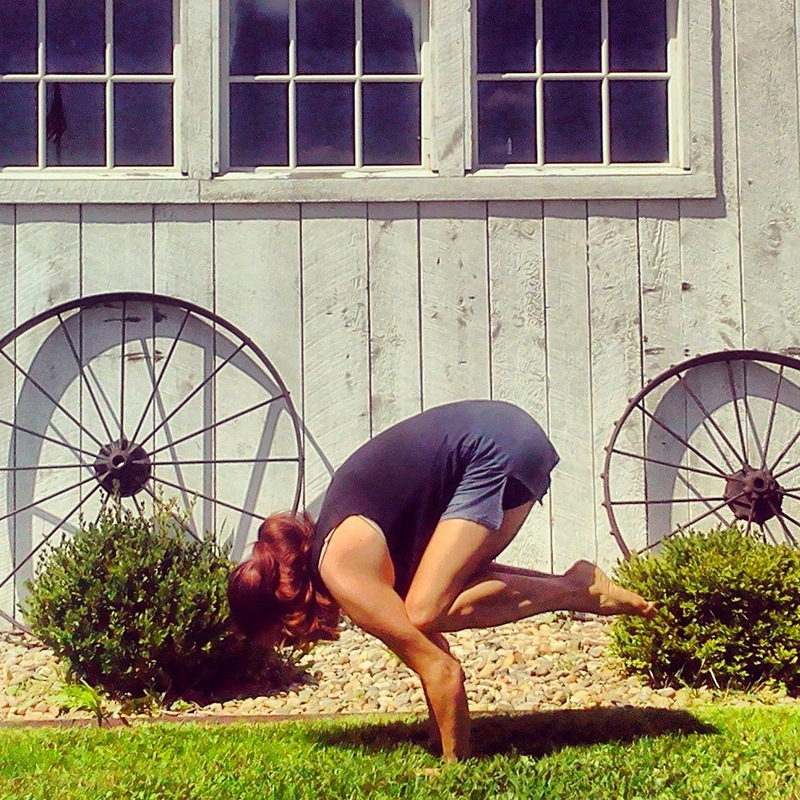 My only negative point was her critique of my crow pose. Hugging knees ito upper arms. Knees balanced on backs of arms. Many of those classes have integrated both versions into the same class allowing the student to attempt them and choose the one they prefer. Well, in Ohana, this second version is considered a “show off” pose used in “those Ashtanga classes” (and this was said with a little bit of a disdain). I’ll tell ya, that was news to me as I was only doing it this way because it’s ‘easier’ for me…not because I view it as more ‘advanced’ or ‘better than anyone else’. Looking toward to back of the studio. This response almost made me dismiss the joy of the remainder of the class but I realized that every one will have opinions and not all will align with mine. I still prefer to do my crow on the backs of my arms but I did her preferred variation for the duration of her class. Other than letting my feelers get a little bruised, it was a great class. Shira was funny and helpful in all her other corrections. During Shivasana she came around and applied some essential oils and gave a little neck rub. It was pure heaven. 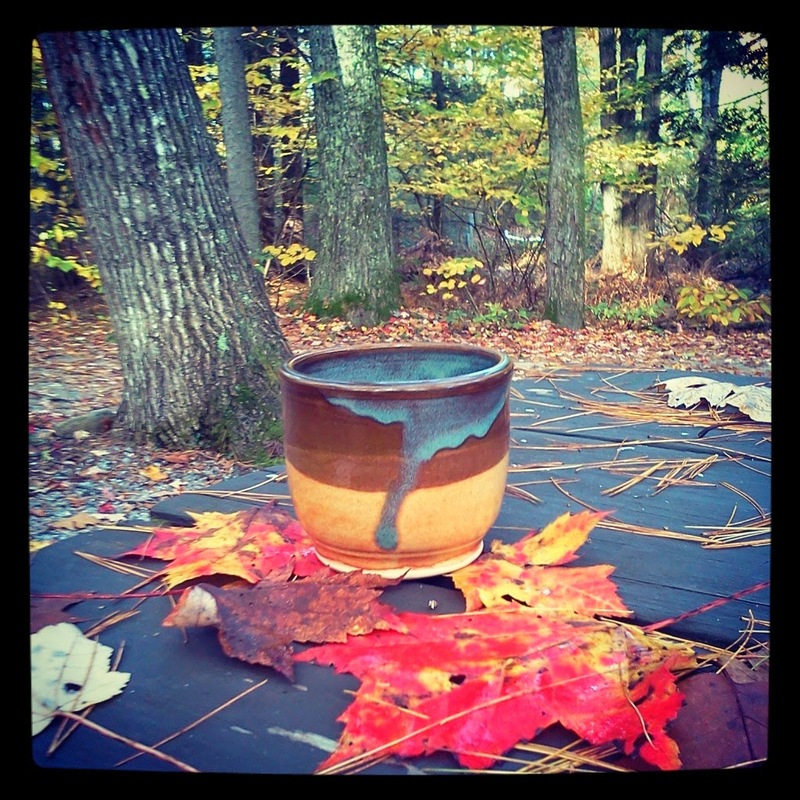 My new coffee cup purchased from a local artist through Ohana Yoga studio. And to top it all off, Ohana supports local artists and craftspeople by offering space to sell handmade soaps, lotions, pottery and other “yogi type” stuff. They also have a small consignment area where I picked up a yoga top and an awesome Vera Bradley purse for $12! 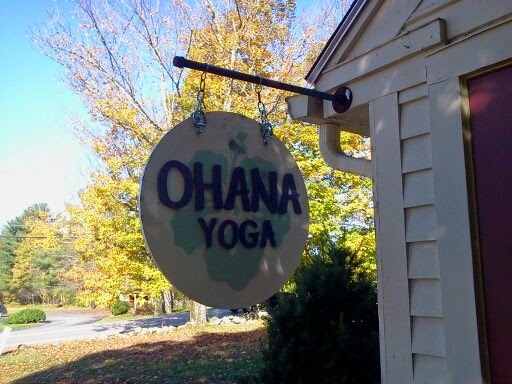 I highly recommend Ohana Yoga (despite our disagreement over crow pose) if your travels take you to the Contoocook area. I’ve found myself comparing the studios I’ve visited since with this one and it definitely set the bar pretty high. How nice of you to write about the studio!! !